Erasmo has tried hard to keep his followers from learning the truth, guy has been and will always continue to be a con artist. When they ask him things, he only responds something along the lines of “I made a lot of mistakes in my past”, to kind of avoid answering the question directly. You might be able to get away with this excuse when you’re a kid or even as a teenager, but even if this mugshot is dated from 20 years ago, he was already a grown man, at age 31, como va el dicho “ya tiene pelos en el culo”. 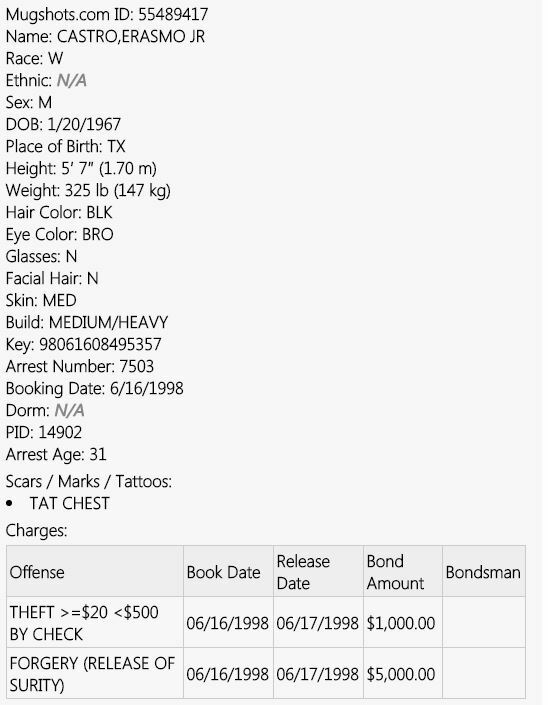 Notice the remark on the scars/marks/tattoos and it says “tat chest”, do you all remember when I wrote about his gay boyfriend and how he tattooed that guys name on his chest? He has told his followers that this is not true, but then again can you trust a known con-artist on telling the truth? You can read about that story here on this link —> Jason Carter, marrano’s ex-bf. Come this November, we are making a stand and voting against this pig.